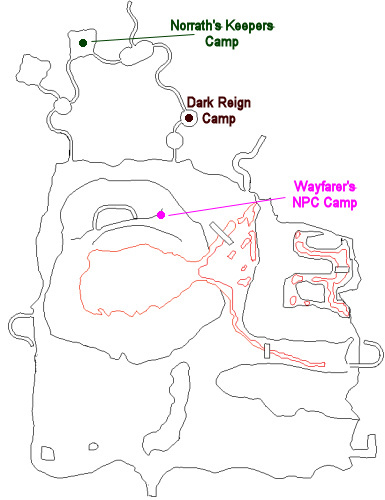 This raid task begins with Captain Aleeth Zyrv (click for map image) in the Dark Reign camp of the Lavastorm Mountains. - Completion of "Muddy the Waters"
- Completion of "Snowfoot Attack"
- Completion of "Knowledge is Power"
You have been assigned the task 'Volkara's Bite'. So, you really wish to take on the queen of the spiders in Lavaspinner's Lair? Interesting. The reason to put an end to this spider, outside of the pleasure in ending the life of a pest, is to end the continual creation of spiders. Do not underestimate this spider, called Volkara. She has a nasty bite and is able to bring spiders to her aid at will. You will need to bring your own army to defeat her, for certain. Don't look to us for help here. You're on your own. Be the first to succeed and you will certainly capture the attention of the commander. The entrance to the instanced zone is in the far southeastern part of the Broodlands. Once inside the zone, head to the far southeastern corner of the zone, where you'll find Volkara - a rather large lavaspinner. Volkara clicks is mandibles at you. Volkara stamps its legs causing eggs to fall from the ceiling. Kill Volkara to complete the task (adds do NOT despawn). Volkara has been slain by _____! Volkara's corpse stumbles and falls to the ground. Your faction standing with Volkara has been adjusted by -1. Your faction standing with Volkara's Brood has been adjusted by -1. With Volkara dead, her plans to build an army of arachnids has been thwarted. Norrathians can rest a little easier. Unhatched eggs seemed to despawn when we did this task today on Phinigel. I'm working on these DoN progression tasks for my 105 wizard and discovered Volkara is exceedingly resistant to fire spells. I didn't get an "immune" message, but she resisted my fire claw and ethereal spells 100%. I had Empowered Focus of Arcanum running at the time, so plan on casting something other than fire if you've got it. Have MT and Cleric crew maintain on the Moma. Throughout the event (I think every 20% or something) eggs (targetable) will spawn, and if they are not killed quickly they will spawn mass amounts of baby spiders that will likely wipe your raid. Have someone designated in each group as main assist and when the eggs spawn the raid leader should spam something like KILL THE EGGS!. Once eggs are done all DPS back on the spider. Rince and repeat. You may chose to BURN the moma spider down as the last eggs spawn near the spiders death and have people zone out to avoid the baby spider wipe just after the Spider dies. This is a good event to use your infusion AA if you have it as the spider has an AE.